-71% OFF on This Product 2019 : Today Only! William Jacket has introduced a new attractive attire jacket which is inspired by the great Movie series Star Trek where Scott Bakula played the character of Captain Jonathan Archer. Captain Jonathan Archer jacket is made with cotton fabric. Internally it has a viscose lining which gives them more comfort in wearing. If you are looking for the species jacket then it will grab your attention because it has 6 pockets. Two pockets are inside the jacket whereas four pockets are placed outside the jacket. Overall it is with the proper length and full sleeve with rib knitted cuffs. It has zip closure front, short length standing collar ribbon feature shoulder. Moreover, this jacket contains the patches of Star fleet logo. It is suitable for parties and fellow gathering. This Star Trek Captain Jonathan Archer Jacket is best for my boyfriend and it fit him. One of my friend recommend me to perches with you and now i think it was a good decision to shop with you. Thank you William Jacket for your Fast Delivery. Star Trek Captain Jonathan Archer Jacket is one of the best suitable jackets for the winter and also for the summer. This Captain Jonathan Archer Jacket is well known by this LOGOS. The Logos and the jacket are the same as shown in the movie Star Trek. Thank you William Jacket for your Fast shipment and good customer support. I bout this jacket for my boyfriend who is a big fan of Star Trek series, hi just pas out from his Air Force training so I surprise him with his favorite character Captain Archer attire. Since I repack this jacket, I found it really worth to give such a quality fabric to someone. 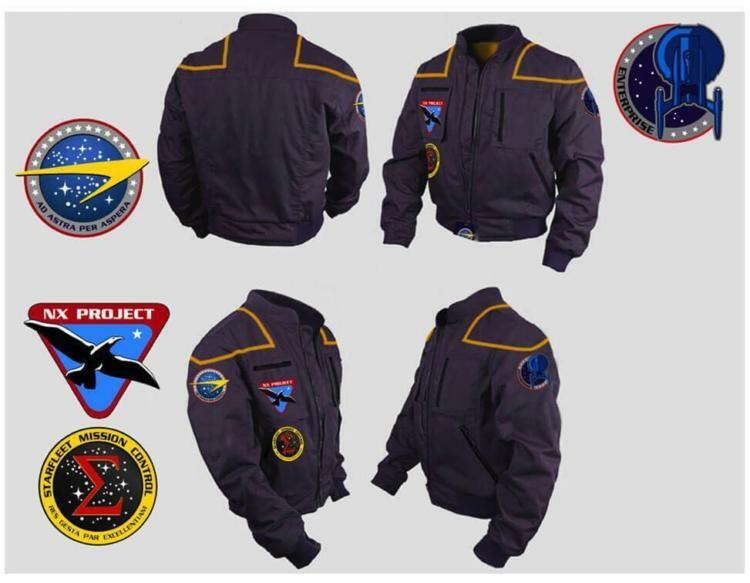 There are many online websites who are selling this Star Trek jacket, but the quality and services William Jacket is providing, it has no comparison to others. I am not saying because I bought this jacket from them, but just letting you aware of the services they are offering really reliable and professionals. I am a major aficionado of Captain Jonathan, however never get an opportunity to have anything in genuine from this amusement so I chose to have Star Trek Jacket. I discovered it extremely great in all actuality, its stuff and style is very extraordinary and complimented. I wish to wear everything the day, however, I can’t, so I never missed any gathering without this outfit. As a big fan of Star Trek, it was like owner for me to buy this captain’s jacket. I would personally thank William Jackets who had maintained the quality features the same as the original one. As it’s made with the quality cotton fabric, so it is kind of lightweight as compared to leather stuff. As a major aficionado of Star Trek, it resembled proprietor for me to purchase this current captain’s jacket. I would by and by express gratitude toward William Jackets who had kept up the quality highlights the same as the first one. As it’s made with the quality cotton texture, so it is somewhat lightweight when contrasted with calfskin stuff. Star Trek is my favorite series, so do its characters and their attires. I saw this jacket while searching over a random crawling at the internet. Its features did not make me so hard to make the decision for buying it. So thanks to William Jacket who made an easy choice of buying a classic jacket.